Previous post: How To Bathe A Rat, If You Really Have To! The sky was heavy with storm clouds when I got into my old Toyota and headed for the Village. The temperature had been miserably hanging around the 90s in New York City for over a week and I looked forward to a good rainstorm to cool things down. I’d set up an interview with Kiz, one of the owners of the Partners & Crime Booksellers, for 6 p.m., a time she said there was usually a lull in the Saturday book buying traffic. Driving into Manhattan was a breeze, as it often is in the summer when everyone is out of the city. I easily found a parking spot only a couple of blocks away from 44 Greenwich Street, where the bookstore is located. I know the area quite well and had been to the bookstore many times for book signings and book launches, but I’d never met Kiz. I didn’t want to get to the bookstore too early. I had an hour to kill and decided to walk around for a while. The neighborhood has gone through a lot of changes since the Partners & Crime Booksellers opened in 1994. The area used to be filled with art shops, funky clothing stores and lots of small mom and pop eateries. The restaurants are now mostly upscale and the blocks and blocks of clothing stores appear to be geared toward a wealthier clientele. But there are still a good number of jazz joints hanging on. The sky grew darker and a slight rain began to fall as I headed back to Greenwich Street. I walked past “Tiles For America” a 9-11 memorial located a block away from the bookstore. The tragedy’s ten-year anniversary is coming up in another month and I still get a shiver when I walk past this memorial. A welcoming light glowed out onto the street from the bookstore and a large window display jokingly made fun of the hot summer weather with a sign that read, “Hot enough for ya? We’ll give you a chill….” and under the sign was prominently displayed a collection of signed mystery books. The bookstore is several steps below street level and I always felt like I was entering a private club when I went shopping in this place. But many of the old time stores in the Village had that kind of feeling. I responded with a nod. The place smelled refreshingly of paper and slightly dusty carpets just the way that most old bookstore goers think a bookstore should smell. There was no odor of coffee, only the delicious smell of books. The shelves were crammed full of new first editions, mass-market books and the larger trade sized publications. One entire bookcase held nothing but out of print paperbacks of every kind of mystery ever written. I made my way to the back of the store were Kiz was using a blood red magic marker to outline the large letters, “Cool Reads” on a piece of poster board. “Thought I’d try to tame the hot weather with some cool books,” she said and without looking up she pointed to the paperbacks strewn about on the wicker table in the middle of the sitting area. They were indeed cool reads: Murder on the Yukon Quest by Sue Henry: Cold Service by Robert B. Parker: The Ice Princess by Camilla Lackberg. I walked around the store taking photos while Kiz secured the “Cool Reads” poster in plain view for the sidewalk traffic before she scattered the books thoughtfully on the window’s ledge. Kiz and the other two owners, both women and both named Maggie, are learning to deal with the changing publishing world. There had originally been five partners, two men and they were both named John, but now the women are the soul owners and boy do these ladies know their mystery books. The first Saturday of every month Cranston & Spade Theater Company puts on a W-WOW! Radio Mystery Hour in the bookstore. It’s a theatrical takeoff on the old-timey radio programs, Kiz explained, when radio plays were performed over the airways. The actors, dressed in period clothes in a set reminiscent of a 1940s radio studio, perform old radio scripts from collections such as Sherlock Holmes, The Thin Man and even The Lone Ranger gets aired from time to time. On Halloween you can bet a favorite is War of the Worlds. The three partners are dealing with the same pressures that all small bookstores owners are coping with. The prices of books have more than doubled since 1994 when the store first opened and not just the price of books have changed. The size of books have gone from the expected small mass market sized paperback book to the larger trade sized books that make it more costly to ship, not to mention having to make room for them on the old shelves. The Partners & Crime Booksellers is a real gem and the partners are not exploring how they can fit into the e-book market. For them that market is just not cost effective. The store carries about 3,500 spine-out paperbacks plus bookshelves of hardcovers and collectible first editions. Like a library, they have to review their shelves regularly using what Kiz called her Bible, to figure out what authors stay on the shelves, which title best represent those authors, and which new publications will be included. These two Maggies and a Kiz love mystery books and, given all the changes in the publishing industry, they are just glad to see that people are still reading. “Sure do,” Kiz said straight faced. As I stepped out into the steamy evening air I heard the cheerful ringing of the cash register. 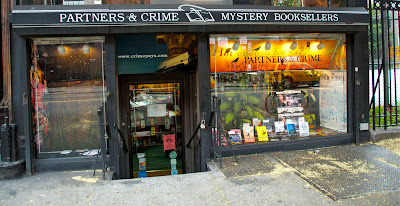 Check out the Partners & Crime Mystery Booksellers website and watch for their booksignings to soon be added to the KRL Mystery Bookstore Event page. Marge, this is a superb piece of writing! I hope you get a lot of PR from it!!! !